Hollywood, Calif. (The Hollywood Times) – 4/11/2019 – “There is no other Classic Film Festival to bring one self to appreciate those timeless classic films like the TCM Classic Film Festival can bring.” Judy Shields, Editor-at-large for The Hollywood Times. Today’s schedule started at 1:00 PM @Club TCM, located in the Roosevelt Hotel main floor ballroom, called “Meet TCM”. The staff of TCM are there to greet and meet the fans of TCM Classic Film Festival, whom most of us have been coming to the Film Festival for up to 10 years and many newbies. Next event was at 3:00 PM @Club TCM – “So You Think You Know the Movies”. Bruce Goldstein, repertory program director of New York’s Film Forum, returned as host of his popular annual quiz, now a TCM Classic Film Festival tradition. Everyone – from casual movies buffs to fanatical film fans – are welcome to take part in the fun and often astounding, team challenge. Always a great fan pleaser, trying to see how much we all really know our movies and it’s surprising how smart we all are! Then there was the annual favorite Opening Night Party @Club TCM with delicious hor d’oeuvres and Icelandic water and spirits. Doors are open for 2 hours so fans of the Classic Film Festival can catch up with friends that they have made through the years of attending, which is the best. I have made many new friends through the Film Festival. Yet another reason to get your pass today! Tonight was the red carpet and screening of When Harry Met Sally. The Screening was at TCL Chinese Theatre IMax and is an invitation only screening with Spotlight and Essential passholders in attendance. 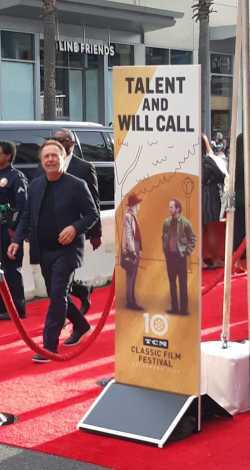 The Hollywood Times did not make the cut to be on the red carpet, but got a few pictures of Billy Crystal, Meg Ryan (here sunglasses, forehead and blonde hair, lol) and Ron Perlman. I bet the they all had a great time talking about the making of the film over thirty years ago. In the Egyptian Theatre there was a screening of Gentlemen Prefer Blondes (1953) and later the screening of The Bachelor and the Bobby-Soxer (1947). At the Chinese Multiplex was Dark Passage (1947); Night World (1932); The Umbrellas of Cherbourg (1964); Mogambo (1953) and Sergeant York (1941) from 6:30 PM start times until 11:30 PM end times. What a line-up of movies to choose from. Poolside over at the Roosevelt Hotel was a special screening of Ocean’s 11 (1960) with special guest Angie Dickinson having a candid talk with TCM Host Ben Mankiewicz. Before the screening there was a great band playing Sinatra, Dino and various artist from the Rat Pack days and they were excellent. When Ben stepped up before the outdoor screen he spoke about the 10th Anniversary Classic Film Festival and the 25th Anniversary of Turner Classic Movies. Of course he talked about his boss Ted Turner. Ben said he and Turner had a sit down interview in Atlanta. We were all honored to watch that interview and hopefully it will be shown on TCM, because it was powerful. The footage of what Mr. Turner has accomplished is inspiring indeed. If you don’t know about Ted Turner, you sure will after that interview and footage. Well done Ben and TCM. Let me tell you, you can tell these two, Ben and Angie really love each other by the way they laugh and enjoy each other’s company. Angie talked about her admiration for Frank Sinatra and how the “M” world was mentioned, but she told Ben that she wasn’t ready to get married then because she wanted to have a career. That sure got a round of applause from the audience. She talked about her contract with Warner Brothers and the movie The Killers (1964) she made with Ronald Reagan, which was his last movie. He would go on to run for Governor of California and win in 1967.